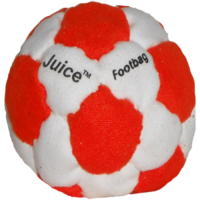 Our most famous footbag design, the 32-panel Juice Pellet Filled Footbag has been copied by many other less-inventive companies. 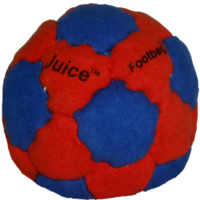 There is no better footbag out there for roundness. 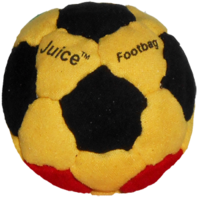 Made from durable synthetic suede and filled with plastic pellets, this hacky sack will last for years. People have had theirs for years, so I said why not buy one and see what the hype is about. 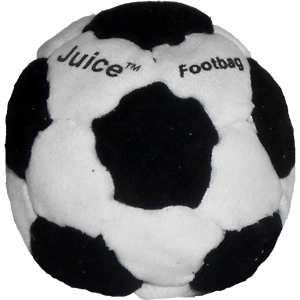 The Juice 32 is great for kicks, practicing on it has made me better at kicking the sand/metal/rubber fill footbags. A real nice pop thanks to its light weight and plastic pellet fill. Stays nice and round thanks to the 32 panels. I got the red/yellow/green/black colorway and am loving it. 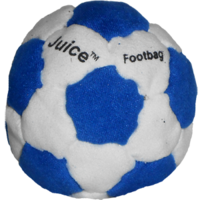 My favorite jkind of juice! 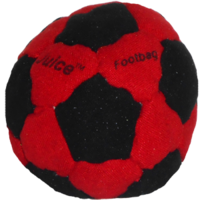 This is one of my favorite all around footbags. 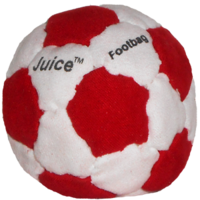 It has nice pop, stays near perfectly round, is pleasant to look at, is very dirable, and the price is right. Defintitely a winning combination for me, thanks flying clipper! I must say, this is my very favorite bag of what I currently own. So far, it is not being the best staller, but I think when it breaks in it will be better. 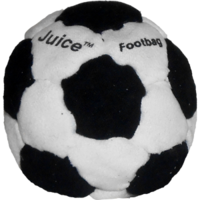 But anyway, the kicking is amazing. I have perfect control over this one. This is a must-buy!